Keep yourself fit and refreshed with the resort's well-equipped gymnasium which includes treadmill, stationary bike and free weights. With natural sunlight streaming in through the massive glass windows, enjoy a energetic workout with panaromic views of the garden and the Indian Ocean in the distance. We recommend you wear comfortable clothes and shoes also carry a water bottle. The swimming pool overlooks the ocean so be sure bring your camera along for some great pictures. Breeze restaurant overlooks Seminyak Beach and offers exotic international as well as local dishes for breakfast, lunch, and romantic sunset dinners. With its beach front setting, great sunset views and the rhythm of the waves, Breeze is one of Bali's most romantic places to dine. Breeze also houses outside seating on a wooden deck surrounded by an elegant water feature. Boasting off a comprehensive wine list, Breeze is one of the beachfront favourites in the Seminyak area. 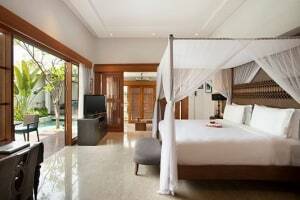 The Samaya Seminyak has only non-smoking rooms, however, it has a designated smoking area on the property. Please note that the property's main pool and beach side area will be undergoing renovation works from 8 January - 28 March 2018. During this period, guests may experience some noise or light disturbances, and some hotel facilities and services may not be available. Check-in and check-out will not be possible on March 7, 2019. One child under 2 years stay free of charge in a crib/cot. One child under 12 years stay free of charge while using an existing bed. Guests can use an extra bed for an additional charge of IDR 1,000,000 per child per night. The maximum number of extra beds that can be accommodated in a room is 1.